Casino Royale is widely regarded as one of the most famous casino movies. In fact, you could even say it’s one of the most iconic casino movies of all time. It introduced us to Daniel Craig’s James Bond and was a huge success at the box office, grossing $600m. Fans of the movie can experience it in a whole new way at the Royal Albert Hall when the movie is screened with a live score by the Royal Philharmonic Concert Orchestra. Leading the orchestra will be none other than David Arnold, the composer for Casino Royale and several other Bond movies. Before the movie screening commences, Arnold will hold a Q&A session with the audience and will discuss his vast experience working with the best-loved spy franchise. The Casino Royale in Montenegro plays a very key role in the eponymous movie and is where some of its most thrilling and intense scenes are set. Le Chiffre is the movie’s villain, a ruthless banker to some of the world’s most notorious terrorists. He’s set to take part in a very high-stakes game of Texas Hold’Em at the Casino Royale, which he needs to win if he’s to remain protected among the terrorists whose activities he’s been funding. It’s up to James Bond to travel to the casino, take part in the same game of Texas Hold’Em as Le Chiffre and make sure he doesn’t win or evade capture. Given what’s at stake, the scenes are certainly very tense indeed. What makes this movie such a casino classic is not only the importance of a table game to the plot, but also the attention to detail, from the workings of the games to the sense of wealth and glamour. This special screening of Casino Royale is being held as part of the Royal Albert Hall’s Films in Concert series. The event sees a number of popular movies screened with live orchestra accompaniment. It kicked off in October 2015 with a screening of Pixar’s Ratatouille, which has been followed by over a dozen screenings. Some of the movies that have already featured as part of the series include Frozen, The Godfather, Titanic, E.T. : the Extra- terrestrial, Harry Potter and the Philosopher’s Stone and Jurassic Park, to name a few. Other movies to be screened in the future include Harry Potter and the Chamber of Secrets, The Addams Family, Jaws and more. There will be three screenings of Casino Royale in total. On Saturday 30 September there will be two screenings, one at 2:30pm and one at 7:30pm. Then on Sunday 1 October, the third and final screening will take place at 1:30pm. Tickets are on sale now and, at the time of writing, there are tickets available for all three screenings, with prices between £35 and £80. Visit the Royal Albert Hall’s official website to purchase tickets for any one of the three screenings. Each performance lasts approximately 145 minutes, with one interval of 25 minutes. As a reminded to those with young children, the film is rated certificate 12. 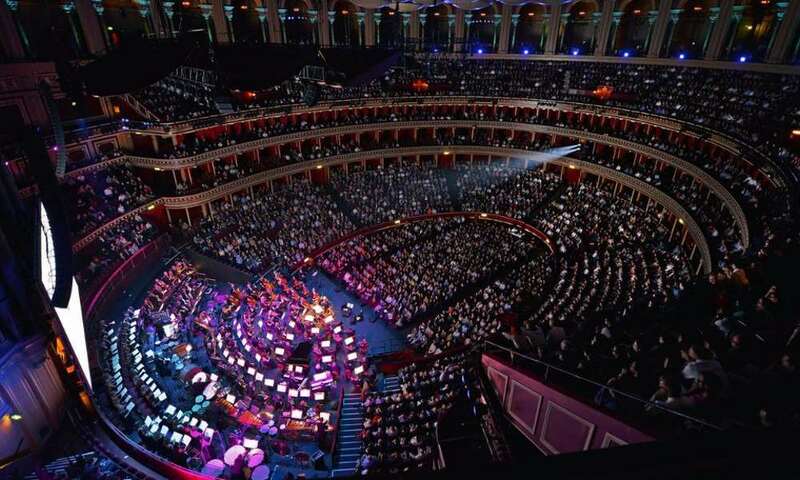 While watching a movie with a live orchestra accompaniment is certainly a novel way of experiencing a movie, the Royal Albert Hall is offering a number of packages to enhance your experience even further. Book the 00 Agent Dining package and you’ll get to enjoy a sumptuous meal at the Royal Albert Hall’s Coda restaurant before enjoying the show in premium seating. Opt for the Shaken Not Stirred Luxury Box Hospitality package and you’ll get to watch the show from a private box, complete with canapés, cold and hot bowl food and a selection of beverages (including a Martini, of course). Finally there’s the Roulette Reception Package, which grants you access to an exclusive VIP lounge and offers premium seating and a range of food and beverages. Supplied by casinopedia.org, the online casino definitions and player insight resource.